This week is a big one for new music. On Wednesday, May 12, we’re digitally servicing the new Everest album, On Approach, and the music keeps coming on Thursday, May 13 with The Flaming Lips‘ cover of Pink Floyd’s Dark Side of the Moon. The band’s currently touring North America, so check tour dates here and see the live show in a city near you. The Flaming Lips released their cover version of Pink Floyd’s Dark Side of the Moon on iTunes in December, some limited edition seafoam green vinyl came out on Record Store Day and Thursday will be your chance to spin the album while your listeners can buy the CD in stores (out now). 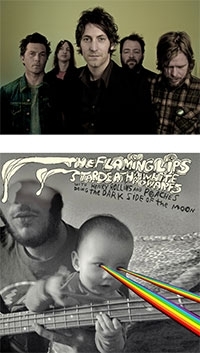 The album is the thirteenth full-length studio album from The Flaming Lips and the full title is The Flaming Lips And Stardeath And White Dwarfs With Henry Rollins And Peaches Doing Dark Side Of The Moon, so obviously it features Stardeath and White Dwarfs, Henry Rollins and Peaches. It is a track-for-track remake of Pink Floyd’s 1973 album.